Chris recently composed and produced the original score for the feature-length documentary Actors of Sound. The score features a chamber group of marimbas, guitars, piano, rhodes, vibraphone, bass, and percussion. Be on the look out for the film in the upcoming year, with more news coming soon. Chris is taking part in the SWR New Jazz Meeting 2015 at SWR in Baden-Baden, Germany. See a page all about the collective and meeting, including video and audio, at the SWR Website. 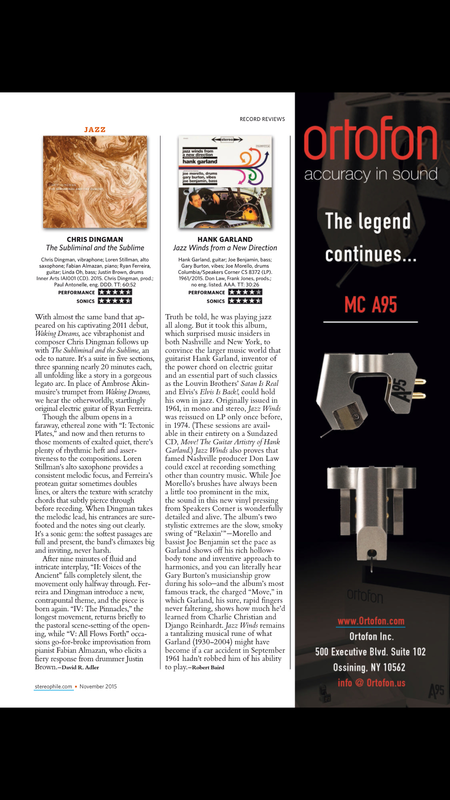 The Subliminal and the Sublime has continued to garner glowing acclaim this fall, this time from Huffington Post, Stereophile, and All About Jazz. 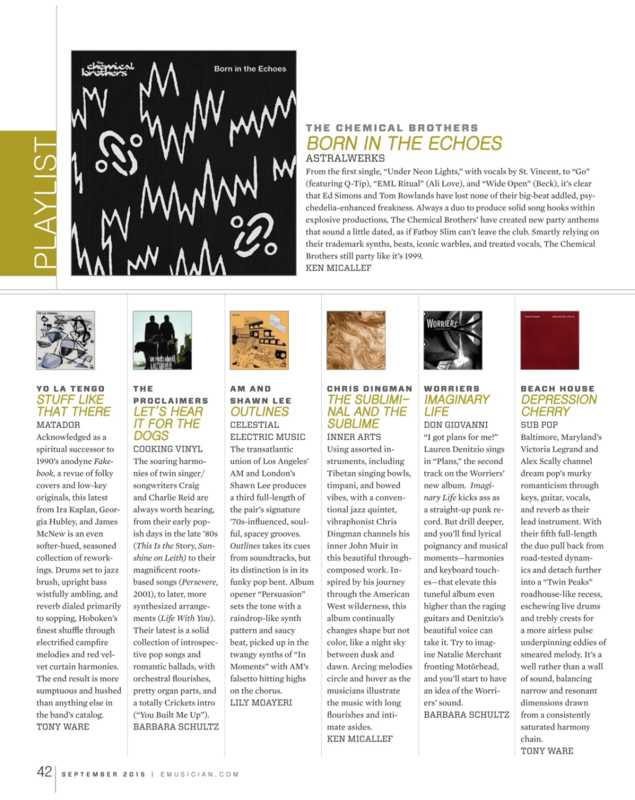 The Subliminal and the Sublime was featured alongside albums from The Chemical Brothers and Yo La Tengo in Electronic Musician. To celebrate the launch of The Subliminal and the Sublime, Chris will bring his sextet to the Greene Space at WNYC on Friday, June 26th at 7:00pm, for an exclusive performance of this sweeping 62-minute work in its entirety. Hosted by Inner Arts Initiative, the evening will also include a conversation with the composer, exploring the connections between music, nature, and the inner search. Bassist/composer Garth Stevenson, internationally acclaimed for his nature-inspired music for film and yoga, will open the event with a brief set. Commissioned by Chamber Music America, The Subliminal and the Sublime blends jazz, contemporary chamber music, minimalism, and ambient electronica with subliminal layers of pattern and detail inspired by the natural world. It features a sextet of virtuosic performers: Dingman on vibraphone, Loren Stillman on alto sax, Fabian Almazan on piano, guitarist Ryan Ferreira and the bass/drums tandem of Linda Oh and Justin Brown. Chris will bring his Waking Dreams sextet to perform a free concert Monday, May 18th at 5pm in Bryant Park, as part of the New Music in Bryant Park series. The series features award-winning classical and jazz ensembles performing back to back each week in May, showcasing works commissioned by Chamber Music America. Featuring Fabian Almazan, Linda Oh, Jared Schonig, Loren Stillman, and Ryan Ferreira, this performance will include excerpts of Chris’s commissioned piece The Subliminal and the Sublime as well as some selected works from his debut album Waking Dreams. Read more about The Subliminal and the Sublime here. New Album Coming June 16! Chris’s newest album, The Subliminal and the Sublime, will be released June 16, 2015, on the Inner Arts label. Commissioned by Chamber Music America and the Doris Duke Foundation, this is the highly-anticipated follow-up to Dingman’s Waking Dreams, which was voted Debut Album of the Year in the 2012 jazz critics poll now hosted by NPR Music. 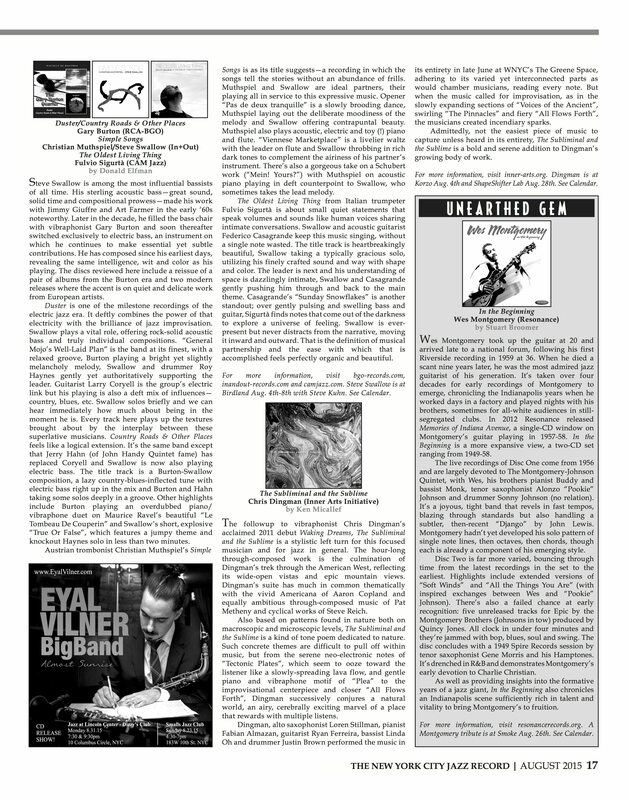 Already called “what might be the best album of the year” in the Lucid Culture concert review, The Subliminal and the Sublime is a monumental 62-minute work continuously unfolding in five movements. Blending jazz, contemporary chamber music, ambient electronica, and minimalism through vivid textures and sweeping narratives, Dingman explores subliminal layers of patterns, detail, and depth inspired by the natural world. Stay tuned for more info, including when and where to preview and pre-order the album.